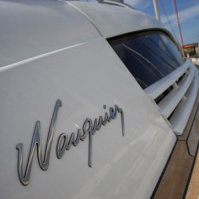 In 2006, from an idea by Florian Coroller, the son of Alain Coroller (Spyrit Boat), in partnership with the Wauquiez site was created a gathering of boats Wauquiez. This event took place every two years on the island of Yeu in the month of May. In a morning fog and a light breeze, the first appointment was met in 2006, nearly 12 boats. In 2008, the second edition of the Escale Wauquiez in Atlantic is held at the Ile d’Yeu during the weekend of May 1 again. You can find all the news of this call Wauquiez by clicking on the slideshow below. Given the enthusiasm of browsers, the stop Wauquiez was given an appointment for the third edition of the 13, 14 and 15 May 2010 Port Crouesty.